Moscow's Black Storm American football team managed a win on Sept. 28 despite the former NFL's star's rejection of the team's offer to play for $2 million. Mikhail Saltzman, the owner of one of Russia’s American football teams, the Moscow Black Storm, invited former NFL star Tim Tebow to the semifinals of the Russian Championship. Tebow, however, declined the offer, refusing the largest payment in the history of Russian sports. Moskovskiye Novosti: You promised a million dollars to Tim Tebow for two games with your Black Storm. Why? Mikhail Saltzman: In fact, a million dollars is a very small amount. I say it seriously and without irony. Of course, we calculated everything. For example, we could hang outdoor banners in several cities for three months for this million. And what would we write on them? “American football is cool!” We could buy uniforms for one million. Well, if we bought 800 such sets, what would we do then? We could send them to different cities, where they would lay and gather dust on the shelves. Therefore, the situation with Tebow was a result of a reasonable business decision. 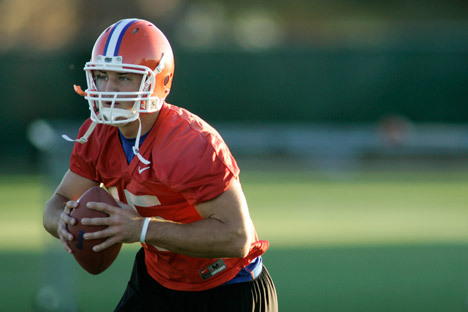 MN: How did the idea occur, and did Tebow know about this invitation? M.S. : At first, we were thinking about whom we could get to take the place of the team quarterback, to replace Kyle Israel. And then someone said jokingly: “Yes, you know, Tim Tebow is a free agent now.” So, we decided that he should be invited to our team, since nobody needed him in the National Football League. In fact, there was a really funny story concerning Tim Tebow. Now, 40 percent of the male population in the U.S. has heard about the Russian American Football team Black Storm. After all, Tebow is the most popular player on the other side of the Atlantic, and Black Storm invited him. There was much talk and writing about this. The story involving our team received a lot of publicity in America. Tim and his agents agreed to the money we had offered, and they were going to apply for a visa and sign the contract; but, in the end, they nevertheless refused. MN: How do you feel about the outcome of the negotiations? M.S. : Now I can say it confidently that we are very pleased that Tebow did not come to us after all, and that we had Kyle on the field. He came to the game after a very serious injury, and, thank God, he did not get hurt, even though he was limping throughout the match. That is true heroism! Tim is good for spectators, but bad for teammates. Therefore, I’m glad that we didn’t sign a contract with him. If that had happened, people would come to see this guy and not our team, not our guys. Then we would have lost the whole idea, which was to show the game with Russian players. Generally speaking, everything turned out perfectly in the end—and we saved a million dollars. MN: Russian semifinals have never been conducted in such conditions before. Are you satisfied with your games against the Moscow Patriots? M.S. : I wanted to make these two games beautiful. I believe that they turned out being played on a very good level. There were many spectators, and all had a good time. First of all, I did all this for my team, because we have many good players. I wanted people to see them. I wanted to make a great holiday for my team, and I made it. MN: The St. Petersburg Griffins will compete against Black Storm in the finals of the Russian Championship. Do you already know where and when the deciding match will be held? M.S. : We have some ideas regarding the venue for the final. We have come to the conclusion that it is useless and pointless to hold it in Moscow, but it would be quite reasonable to arrange the game in St. Petersburg. However, it is very important to understand that I have nothing to do with the situation in Russian American Football—I just run my team. If we are going to create a professional league, you must understand that there are mandatory investments in the amount of $5 million that must be raised. I don’t have such money. Accordingly, if we find the money, we will make this league; if we don’t, then we will not. MN: To date, are there any individuals or organizations interested in providing financing? M.S. : Yes, today there are several American foundations that are ready to provide the necessary money—even tomorrow. However, they are ready only in theory, since they haven’t given us anything in practice.